Block Ransomware, Malware, and Spyware Attacks!! Get protection like you've never had before. With this Win Patrol Ultimate Bundle. 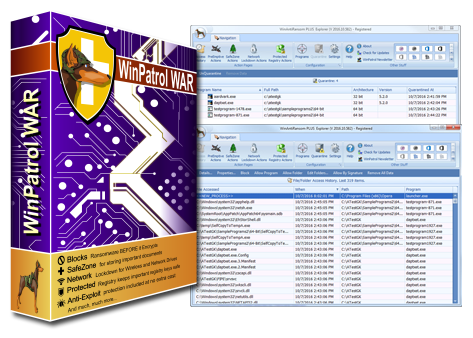 The Ultimate Bundle includes Anonymous, Single Registration licences for WAR, WinPatrol PLUS, and WinPatrol Firewall. 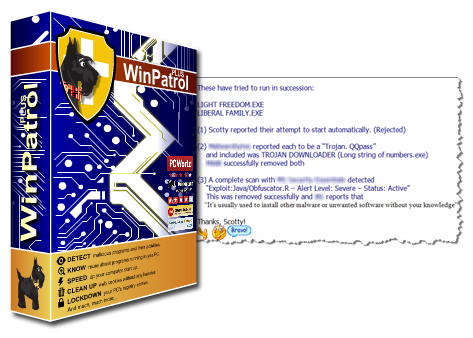 WinPatrol WAR blocks Ransomware and malware attacks before you get infected. 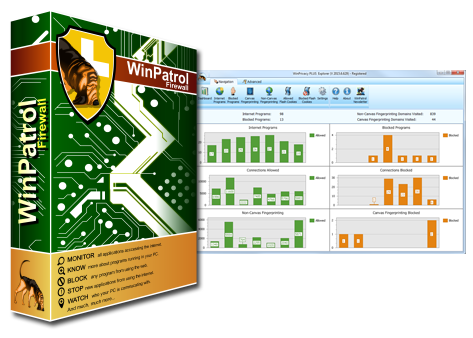 WinPatrol PLUS prevents malware intrusion and gives you control over startup-programs, tasks, cookies and more. 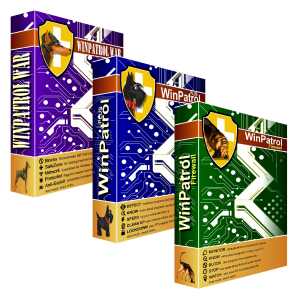 WinPatrol FIREWALL gives you control over which programs can use the Internet and blocks unknown programs from using the Internet. If you reformat the computer, the license will no longer work. If you purchase a new computer, the license is no longer valid. If you lose your license, we have no way of looking it up. With this license you receive a 30 day money back guarantee and all future updates/upgrades to WinPatrol WAR as long as your license remains valid. May be used in small businesses. Malware or malicious software, is any program or file that is harmful to a computer user. Malware includes computer viruses, worms, Trojan horses, and spyware. These malicious programs can perform a variety of functions, including stealing, encrypting or deleting sensitive data, altering or hijacking core computing functions and monitoring users' computer activity without their permission. Where as Ransomware, is Malware with attitude. It not only invades your computer, but it also seeks out and encrypts all of your pictures, documents, music and other valued documents. Then, it demands you pay a ransom or they will delete the files. The FBI’s advice? Pay the ransom. That’s right, even the Federal Government is unable to decrypt the files once encrypted. If you don’t have a back-up, you have no choice but to pay-up if you want the files back. Would I rather pay a little for protection and peace of mind, or would I rather have to figure out how to sign-up for and use Bitcoin, expose myself to the dark-side of the web by using it and pay $500 or more for the return of my files? Your Solution to Ransomware, Malware, and Spyware! Immunize your computer against ransomware, malware, and zero day threats with our artificial intelligence engine that gives ransomware and malware a taste of it’s own medicine and blocks them before they can infect. PreEmptive Strike. First line of defense, blocking Ransomware, malware and zero-day threats BEFORE they can do any damage or encrypt your data. Network Lockdown. Only known good programs have access your network data. If an unknown or known bad program attempts to access your network resources, we block it. SafeZone. SafeZones are folder(s) on the local workstation and/or laptop where only known good programs have access. If any unknown or known bad program attempts to access a SafeZone, we block it. Protected Registry. Simply by installing our program, we protects hundreds of system critical registry keys. On top of that, you can define keys of your own to have protected as well. If an unknown or known bad programs attempts to alter or remove any of the protected keys, we block it. Tried and true Host Intrusion Protection system that also provides great system utility functionality like ability to delay start-up programs, schedule task monitoring, browser cookie clean-up and now in the latest release file size monitoring. Referred to as the “World’s Easiest to use Personal Firewall”, WinPatrol Firewall blocks any unknown programs from using the Internet and much more. Since it’s release, WinPatrol Firewall has blocked hundreds of thousands of malware infections before they happened. Get protection like you've never had before! All three of our products together on one computer provides you with complete protection. Detected 97 percent of my samples, same as Norton and Trend Micro Antivirus+ Security and a few others. Extremely good. APEX on my list of safe protection wares. This is #1 on the 99.99% virus/malware user prevention scale. We don't sell your i​​​​nformation. Take charge of your computers! With Anonymous, Single Registration Licenses. No emails from us or partners. No hassles. No Annual Renewals.